Slow at first, The Hunter is one of those movies that nevertheless pulls you in if for no other reason than you want to what the hell is going on. Despite its quietness, the film, which is based on the novel by Julia Leigh , has a lot of plot. Willem Dafoe (John Carter) plays Martin David, a hunting expert (read: loner) who’s hired to go to Australia’s Tasmania to track down and kill the rumored last Tasmanian Tiger. It’s said the animal can paralyze its prey, and the company that has hired David wants him to return the tiger’s various organs for study. Seems simple enough, but there’s more. The woods where the tiger is supposed to be is in logging areas, and David’s work isn’t liked by the loggers. Meanwhile, there’s another faction that wants logging to be stopped, adding tension between them and the loggers. And the family that David stays with has a mother (Frances O’Connor) who leaves her two children to fend for themselves, as she deals with her husband’s absence, who had also looked for the Tasmanian Tiger before he had disappeared. Yes, lots and lots of plot. Director Daniel Nettheim (Angst), who’s known more for TV work, did a good job of weaving it all and showing how everything connects in the end. The story does have the danger of alienating its audience as it tries to introduce all the threads at the beginning, but it’s Dafoe’s performance that keeps us watching. He’s understated and solid as he goes from uncaring loner to caring father figure. The rest of the performances are equally good, with O’Connor as the flaky mother, Sam Neill (TV’s Alcatraz) as the man who’s caught between the tensions in the area, and the amazing young actors who played the two children, Sass (Morgana Davies) and Bike (Finn Woodlock). 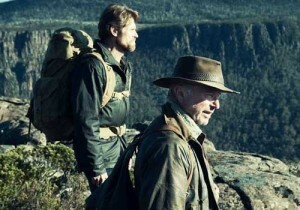 The movie’s cinematography shows the stunning countryside, with luxurious long shots of mountains, creeks and the clear blue sky. The movie probably looks great in high-definition Blu-ray, but our standard-definition DVD still looked good. If you’re patient, The Hunter will reward you with an interesting and heart-pulling couple of hours of entertainment, but be warned you’ll need tissues for the end. The good entertainment is carried over into the DVD’s special features, which are solid and much better than most. The behind-the-scenes featurettes cover the actors, casting, production, locations and even the legend of the Tasmanian Tiger itself, which Nettheim admits he’s now somewhat a believer that there is one out there somewhere. The pieces, which can be played back to back as one longer featurette, offer more than just the actors and director saying how happy they are to work with one another. They give good insight into the challenges of making the independent film. The handful of deleted scenes are brief but show fine performances. They can be played with or without commentary from Nettheim, who basically tells us the scenes were cut to preserve the movie’s pacing. Nettheim and producer Vincent Sheehan recorded a full commentary track for the movie. They go into further details about the film’s shoot, with post-production tricks (the mountain behind the house was added digitally), behind-the-scenes stories (dealing with the locals) and other tidbits (young Finn did all his own drawings for the movie).